The absence of religion in the Christian festival. As the years go on Christmas is starting to revolve less and less around Christianity and celebrating the birth of Jesus and more and more around money. This change has been catalysed by secularisation and the increase of people believing in atheism, or rather lacking a belief in a higher power. Of course, this is understandable due to the state of the world recently and all the tragedy going on within it – why would anyone believe in a benevolent God when there is so much suffering? Even so though, if the majority of us in the UK are not particularly religious, why do we still celebrate Christmas? The simple answer is capitalism. 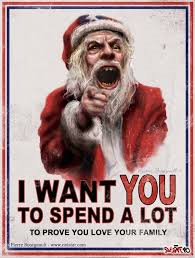 Christmas has become commercialised: used by conglomerates and big companies as a way of gross mass marketing, to get people to spend more than they can afford on things that have no meaning other than to satisfy their lust for material possessions. They are using the name of Christmas – typically associated with happiness and family- to grow their own pockets, bring billions of pounds into their businesses, the economy and subsequently boosting the stocks markets. The truth of the matter is many industries would crash and burn without Christmas as they depend very heavily on holiday sales. The media has augmented this by creating a ‘Christmas craze’, for example, the introduction of Santa. What has a fat man in a red suit got to do with the birth of a god? An example of this craze can be seen if you Google Christmas, the only results that show on the first page are related to shopping. Non-religious symbols and an emphasis on material things such as food and presents has allowed people to forget about the original meaning of Christmas and desire a more inclusive, secular Christmas (the Bourgeoisie’s dream).